In 2008, X Alfonso made Sin título, an Italian-produced documentary which was debuted at the Mella Theater in Havana with musicians, theater people, dancers and visual artists brought together by X to interact amongst each other and with the audience. The theme of the documentary was to show artists as human beings, beyond their public images. This vision of working on the same event and with the same purpose with artists from different media was the spark that saw the birth of Fábrica de Arte Cubano (Cuban Art Factory), a project that was headquartered in the PABEXPO Exhibition Center from mid-2010 and carried on its activities there for almost two years. For the past two years they have been involved in finding a new physical location for FAC, some place that would truly belong to it and that did not have to depend on others to schedule its artistic calendar. 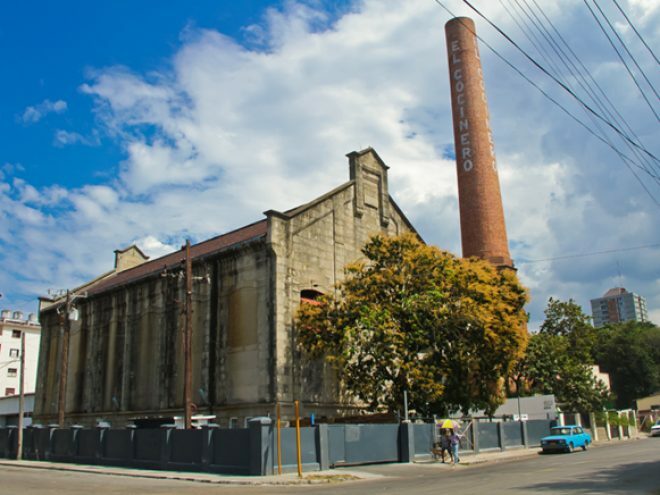 Finally they found the perfect spot in the former El Cocinero, originally the headquarters for Havana’s electricity company, then converted to an olive oil factory on the corner of 11th and 26th streets in Vedado, near the Puente de Hierro (iron bridge). Doors opened to the public on February 13, 2014 with a big bang. Its first exhibition included works of 33 Cuban artists, such as Nelson Domínguez, Zaida del Río, Ernesto Rancaño, Eduardo Roca (Choco), Esterio Segura and Ernesto Rancaño just to name a few. The inaugural concert by X Alfonso was followed the next day, February 14, by a concert with Silvio Rodriguez. On the 15th, Aldo López-Gavilán, Harold López-Nussa, X Alfonso, Rochy Ameneiro, Polito Ibáñez, Raúl Torres, Frank Delgado, Gerardo Alfonso, Tesis de Menta and Vicente Feliú paid a moving tribute to trovador Santiago Feliú, who had been scheduled to give a concert that day, if his heart hadn’t failed just four days before the opening. Entrance is CUC 2 or 50 Cuban Pesos. Note that when you enter you are given a card on which your food and drinks are marked on—you pay on the way out. Don’t lose the card, it will cost you CUC 30! by Reinaldo Ortega, producer and creator of F.A.C.’s visual arts section. The project is designed for people to show up and consume art. We are not working for the usual gallery-hopping crowd that goes to shows with their hands in their pockets, looking for something new. We need to find the way to reach people who have never gone to a gallery or a theater and who suddenly are being faced with this trap, like a spectacle, something unusual but attractive. Those are the people we are working for. We normally use music as a hook, then at some point in the evening there will be a performance or a dance number followed by DJs, disco or background music, all “decorated” with visual art work. Setting it up this way means that not only do people have a good time but we have the Factory fulfilling an educational function, in some way exerting an influence on them because of what they are seeing and hearing, what surrounds them, something they cannot escape. Everything functions with lights, space, texture, muted colors, everything done tastefully. Often young people have to pay a lot to find places where they can be entertained and at the end of the day, these places might not even be what they really like. The Factory is being promoted on the streets and also at the universities. Our space connects persons who share common concerns. Those going to the Factory have access to musicians, painters and dancers… this is living culture being produced right there and then. However the most important thing is that we have managed to get artists from different manifestations to get closer to each other and to their audiences and for audiences to get closer to the art work. Members of the audiences can even get closer to each other. We especially have to keep in mind that Cuban audiences possess a lot of information and sometimes don’t have places where they can hang out, places that first and foremost are related to cultural events. As visual artists we have always wanted to understand contemporary Cuban thinking—what trends does it espouse, what motivates us, what are the younger generations thinking? These sorts of dialogues are usually not being heard. In our day and age, generally speaking, lives are being lived with indifference. We feel that such alienation cannot be ignored. Our crucial criterion in selecting creators is that they are dealing with socially-oriented topics. We are not interested in visual artists who need an excuse to exhibit their work. Abstraction has no validity for us; we want to see what you are saying about the moment in which you are alive; that as an artist you are not indifferent to the times you are living in and that you want to do your bit. Fábrica de Arte is a completely independent project and therefore needs to be self-sufficient. We are looking for hard-working motivated people who share our vision. We don’t care if an artist has a degree of not. My experience tells me about what they are capable of. We don’t care what province they come from, we recruit participants nationwide and even include foreign artists. What we care about is their work and their attitudes, that’s what we assess in an interview. We hold open recruitments not just for photography but for sculpture and installations as well. We want to see innovative proposals and then we try to find concrete and practical solutions for mounting the work.